Our first meeting of 2016 has been pre-empted by a workshop being hosted by Barbara Kyle on January 21st, 2016. The workshop will be conducted via Skype and members of the guild will be participating as a group from the Older Adult Centre at the YMCA in Kinsmen Room “C”. We’ll meet at 6 pm and the workshop is scheduled to begin at 6:30 pm. The topic will be “Crafting the Page-Turner: Magic and Verve in Your First 30 Pages.” The talk will be approx. 45 minutes, followed by a Q&A session. As part of the workshops Barbara is conducting in January she is hosting a draw to win a free manuscript evaluation of the first 25 pages of the winner’s WIP. There will be one winner from across all the workshops. The Sudbury Writers’ Guild meeting scheduled for January 28th, 2016 has been cancelled. The next regularly scheduled meeting will be February 25th, 2016. Andy Taylor, December 14, 2015. No Comments on January 21st, 2016 – Workshop with Barbara Kyle.Category: Sudbury Writers' Guild Meeting, Workshops. Tagged: Barbara Kyle, Meeting, Workshop, writing. Bring your fiction up to the next level in morning workshops with Gail Anderson-Dargatz and enjoy everything the island has to offer later in the day. The camp runs July 19 to 24. Workshop space and accommodation is limited, so book now. For details, see Gail Anderson-Dargatz website. Andy Taylor, March 2, 2015. 3 Comments on Gail Anderson-Dargatz – Providence Bay Writers’ Camp.Category: News, Workshops. 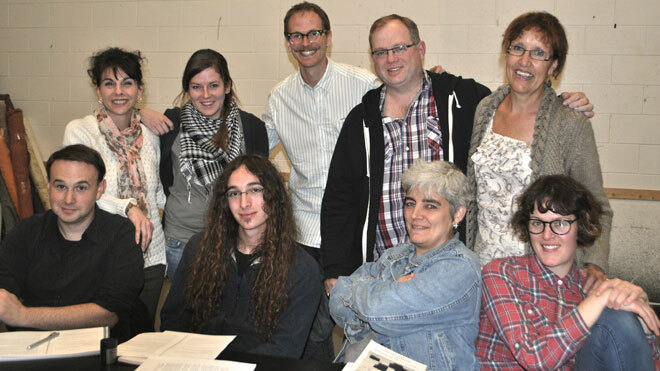 Participants in 2013-14 Playwright’s Junction include (back row, from left) Line Roberge, Caitlin Heppner, Matthew Heiti (co-ordinator), Andy Taylor and Jan Buley, (front row, from left) Jesse Brady, Jordano Bortolotto, Marie Woodrow and Anne Boulton. Last year I participated in the Playwrights’ Junction workshop offered by the Sudbury Theatre Centre and led by playwright-in-residence Matthew Heiti and it was one of the best learning of experiences of my writing career yet. They’re currently taking applications for the 4th season of the workshop (Deadline is September 15th) and I want to tell you why you should consider applying. When I applied last year I had no illusion that I was a playwright, but I didn’t let that stop me. Writing for the stage is a unique experience, but there is a whole lot of overlap between writing prose for novels as there is in writing for theatre. I went in with an open mind. One of the things about being a “new” writer is that we are often trying to find our voice. Part of that journey can be experimenting in different genres and different mediums. Here’s just a few of the things I appreciated about the workshop and that helped me grow as a writer. DIALOGUE – In writing prose for novels, you can spend pages setting scenes, describing character’s motivations, moods and backstory. In theatre a lot of what gets conveyed to the audience is done through dialogue between characters (or in some cases monologues). The workshop definitely helped me see dialogue in an entirely new light. MOTIVATION – If you’re like me it’s easier to say “I will get around to finishing that scene tomorrow, after I’ve binge watched this latest season on Netflix.” than it is to get motivated to spend time writing something that isn’t flowing. The writing assignments we had in the workshop helped motivate me into writing to a deadline. It was surprising how easy it was to get the muse to cooperate when there was a looming deadline to turn in an assignment. FOCUS – Writing for the stage has unique constraints that might seem limiting by some, but can actually be freeing as it forces you to focus your writing. Your writing becomes sharper when you have to do more with less. FEEDBACK – As scary as it sounds to some people, getting feedback on your work is an essential part to improving your craft. Having people critique your work in the workshop helped me to learn what was working and what wasn’t in my writing. Almost more important was what I learned by critiquing other people’s work. I could see my own strengths and weaknesses as a writer reflected back at me in their own work. SHARING – Writing can be a very solitary and lonely experience. We often toil at our drafts for weeks, months, years on end before they see the light of day. The writing workshop allowed me share my work with my fellow playwrights and the instructor. As part of our “graduation” we had one of our pieces read aloud by professional actors in front of a live audience. Getting a laugh for a line you wrote can be just the carrot you need to keep writing. I can’t say enough about Matthew Heiti as the instructor. Matthew is knowledgeable beyond his years when it comes to writing both prose and for the stage. He treated us fledgling playwrights as peers and gave us this once in a lifetime look behind the scenes of what goes into developing work for the stage. I am forever grateful for the experience of being a part of the Playwright Junction and I hope you’ll take the opportunity to apply. I’ll be in the audience cheering you on if you do apply. Andy Taylor, September 1, 2014. No Comments on Playwrights’ Junction Workshop – APPLY NOW.Category: News, Other Writing Events, Workshops. Tagged: Matthew Heiti, Playwrights' Junction, Sudbury, Sudbury Theatre Centre.